It's so important to create an instant visual impact because people form an opinion of your home within the first 20 seconds of entering. Here's another beautiful stair runner I created. Here I gave a contemporary look to a client's extended Edwardian home. Given the passion the owner has for their outside space, it was crucial that the colours used in the kitchen/diner complemented the soft colours of the garden. This client wanted me to transform their sitting room from a bland space into a sophisticated room for adults to relax in. This post includes ideas and inspiration for revamping your own sitting room. Converting a large Victorian family home can be a challenge for anyone, so I love being able help guide the interior decorating process. See how this kitchen and dining area has been given a new lease of life. This 80s-styled bathroom was in need of a makeover. Find out how I made the transition to a more modern, sleek look. A sense of light and space created by the white painted balusters and bannisters and light coloured carpet. Choosing the final touches for your renovation can be daunting. See how I helped Balham local, Faye, choose the floor covering for her loft conversion. Just by changing one or two items in a space can make a huge difference to the look and feel. In my hallway I have just changed the small table and hung a rug on the wall and the transformation is amazing. Finding the right furniture pieces to suit your style can take time, but it's worth the wait to bring the perfect blend of your personality to a room. See how I finished my sitting room and stairs. What a difference a little fabric makes. 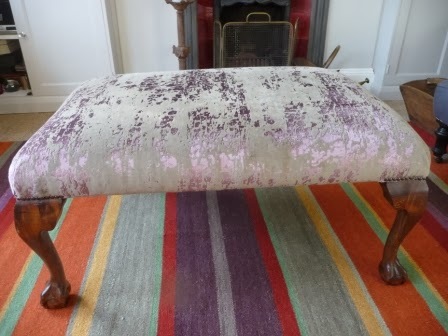 Here, I've reupholstered my 'coffee table' ottoman and replaced the sitting room rug, and the effect is splendid. Don't be afraid to change your mind when it comes to interior decorating. If something's not working, you can fix it. That's what I did when my stair revamp didn't quite work out the way I planned the first time. See how you can transform three rugs into a fantastically stylish runner for your front entrance.